Thoughts — K.D. Adams | What's Your Story? No pie again, alas -- but a fresh slice nonetheless! A bit over one month ago, my ortho doc replaced my right knee joint with a cyber one. Other remedies, including months of therapy, were tried without much success. The last, pre-surgical effort: injection of hyaluronic acid from rooster comb, to lubricate mechanics. Life-roughened surfaces wouldn’t move freely. This is a zerk. Used in countless applications, the device permits oil to be supplied into gears, etc. Its inventor, Oscar U. Zerk, brought his idea to the world around 1929. Zerks are essential oil-delivery components in many industries. Before I draw connection between the paragraphs above, I must take yet another direction that occurred to me, while recovering from the knee procedure. On a dusty dirt road in the Ozarks, decades ago, the vehicle my husband and I were driving broke down. Somehow, based on clues sent from the engine’s sound, Thom had an idea about the cause. He crawled under the front end with tools in hand, and soon said he thought he’d tracked down the issue. “It’s a zerk,” he reported. I’d never heard the word, and said so. He kept working on something-or-other while I watched out for cars heading our way. Soon he added another fact. “Our van is—berserk?” I grinned. Don’t you love words? The hot day, insects rising along with dirt below our feet, the inconvenience of a breakdown—all disappeared, the moment that preposterous synchronicity fell into place. Feel free to chase down other less-fun applications of the word, crazies who took to violence to express themselves, etc. – I’d settled on “berserk” as an inside joke about one hot Missouri summer afternoon, until my knee wonked out. It went—berserk. The meniscus tore, connective bone bruised, and a fall last summer worsened pre-existing damage. The parts weren’t cushioned properly, and sent searing pain messages until it was fixed—replaced. Now, waves of pain from reconnecting muscles, tendons and tissues are somewhat ameliorated with prescribed med’s and ice packs. Today I drove for the first time in six weeks, hurrah; exiting the car requires that I lead cane-first, followed by feet and the rest. Still, I’m happy Spring is here, hope to walk smoothly again soon, even make some progress with veggie gardening. And I’m happy to be one day closer to a pain-free “normal” again! Thanks to everyone who has helped me along this journey. March fourteenth is National Pi Day ! I’ve been off pastry, but may indulge—and encourage you to celebrate however you choose! I’ve been reluctant to write much, and limited other creative efforts to small-scale fiber projects, of late. “Dragging my feet” has taken on new meaning, due to the restraint of a wrecked knee. The meniscus tore some time ago, along with lateral insults and bone bruises. Lit and confirmed by x-rays, after other treatment didn’t work, it’s the Doc’s order. The Ides of March —the fifteenth of the month—significant in ancient Rome, and not just for Julius Caesar, is D-day. I’ll be submerged, unconscious, during my first major surgery. Preparation’s been thorough; recovery will be lengthy. But a friend pointed out, it’s pretty miraculous to access body-shop replacement for an actual body. Knee joint repair has refined markedly since the early 1970’s. People who undergo the procedure cite wide-ranging outcomes. So it goes. “Creativity takes courage,” Henri Matisse said. And with most new endeavors comes discomfort, if merely through accommodating the new: fresh perspectives, added responsibility, changes welcomed and others not so much. With this writing, I’m breaking free from stunned silence, ahead of this milestone. That’s a first step, wobbly but determined. Hope you’ll roll right on through to the seventeenth— St. Pat’s Day —feet a-flying! Slainte: Good Health! / Cheers! Erin Go Bragh: Ireland Forever! Like many others, I’ve found this to be a most challenging year. The very fabric of our country has been—and continues to be—stretched over untenable circumstances. Untenable. Here’s how an online thesaurus frames the word and its meaning. : indefensible, insupportable, unsusatinable, unjustified, unjustifiable, flimsy, weak, shaky. I’ve gone on a Facebook-free digital diet for a number of months. You probably can guess why: I can’t sustain a requisite equilibrium, against the flow of so many furious posts. Also, my internal outrage-meter is sensitized by so, so much that is unconscionable, I needed to find ways to protect my mind and heart. Increased reading. From The Sun and The Atlantic Monthly mags, to newly released fiction and non-fiction, I’m better with quality writing nearby. Food for the mind and heart helps. Poetry. I’ve learned that when much life must be processed, a little time works wonders. One technique of mine is writing quick haiku poems. The non-threatening structure of that form appeals and invites play. Five syllables, seven syllables, five syllables. Preferably with nature reference, but not necessary. Looks so simple! Words like a bouncing ball, framed by the world that touches our skin. Here are a couple, written in a small Moleskine® journal just after Thanksgiving. prefer, instead, a new peace. days, months, years, and grace. Another personal solution: play with fabric and fiber. A new acquaintance in my region has opened a coffeehouse/ meeting center/ gallery. My book, photographs, and other creations are available for purchase there. Plus, there’s a sweet baby and a steady stream of artistic, musically inclined people in the place. And vinyl nights. And open mic. The Spot, it’s called, in Williamsburg Square mall, Owensboro Kentucky. I fashion kid-friendly toys and books, pet-related goodies, warm snuggly scarves and mitts. Each item requires full attention and ingenuity, happily applied. Quite often, when my eyes and hands are occupied, inspiration arrives about some bit of writing underway. The Muse loves creative activity of any kind. One more substitute for frenetic panic, during the present political debacle: get physical. “Me, too” resonates with virtually--nearly every--woman I know, as applied to having experienced funky offenses. I’m putting together a dovetail-joint-tight presentation. My intent: meeting with those who are acknowledging, often for the first time, travesties in their past. Guest speaker panel, generative program, plenty of take-aways: that’s part of the vision. I’ll be glad to keep you informed as this “What’s Your Story?” event takes shape. And I welcome your comments. Stay strong, write on, be kind. And Merry Christmas, too! Did the sun and moon move for you, last month? Yeah, me too. I particularly loved the shadow crescents, scattered across the ground, our bodies, all earth-bound surfaces. But given more recent happenings, that globe-crossing eclipse has itself been eclipsed. Nonetheless, here’s a salute to the event. Remember these sugar bombs? Here’s my recall. 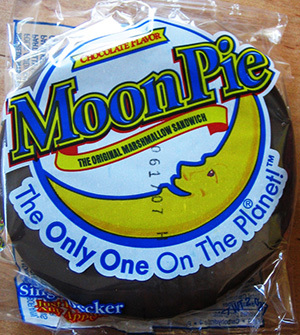 High school lunches, off-campus in the rural South, built of Moon Pie and a Yoo-Hoo! Another choice: ‘Bama Pies – gooey pecan mini-treats. Planet-glazing events prompt the Neapolitan reference. The word refers to Naples, and its people—originally in Italy and also in southwest Florida. “Our” Naples and its surrounds reels to recover normalcy, post-Hurricane Irma. Power won’t be restored, gulfcoast residents are told, until after the 20th of the month, more than two weeks after Irma made landfall on Florida’s west coasts. The Keys are mostly unrecognizable; Miami’s flooding exceeds all historical records. I’m still processing these recent events, the eclipse and the hurricane. I have no summary sentence here, except: let’s do what we can to help those who need us. Everywhere. Simple enough solution, and plenty sufficient for a lifetime. Lush and luscious July! Its days burn fast, then disappear into nights voiced with owl calls and frog chorus. No time, so far, to build a pie—lots more underway. In May, after speaking at a conference, then a book launch in Wisconsin, I found a pocket of time for pure fun. I finally flew through the air on ziplines - the last run so high, my feet grazed treetops! Additional bonuses, the walking tour of pre-tourist-season streets and a horse drawn ride through caverns of the Dells. The lemon chiffon pie, luxuriously dressed in drizzled raspberry and mint, topped that red-letter day, better still because it was shared. Make some sweet memories. With the change of seasons, I resumed working my veggie gardens. Each year I launch into transforming new planting areas. Time and again, knee- and wrist-deep in soil, breakthroughs arrive concerning a scene I’m writing. Or perhaps a warbler’s song quickens recall of buried memories—mushroom hunting with my Mom, getting lost in a Michigan woods. And up I get, half-running to the deck, peeling off muddy shoes and gloves in my rush to trap words with pencil or laptop. By the time I return to outside projects, my mind’s still pacing the shores of some distant river, or gazing into night skies a thousand miles away. That’s the shape-shifting focus of being a writer, for me! Times I’m totally, physically engaged in messy activity, mental tumblers roll and click, with insights that won’t arrive on my terms. And I’ve turned that reality to my advantage, so I’ve never felt the pang of “writer’s block,” whatever peculiar definition that holds for others. I spread out chipped Blue Willow china across the outdoor working surface used for mosaic constructions. The wind whipped volleys of rain just off the deck as I pieced together the image in my mind: a bluebird. The project’s not completed yet, but it appears here, as is so far. A half-dozen memories flooded my mind, from last summer’s visit of a beloved young relative. She’d also pressed bits of broken tile and glass for her mosaic. I remembered things never recorded, so moved to my keyboard and spent a bit of time locking words into shape. Then I texted her, with a picture of my efforts, sending love. Sweet life! A few weeks ago, I rose from my seat and walked to an open mic. It wasn’t my first time up—and, happily, I can say I don’t freeze up with public speaking. Moreover, I’d prepared not one, but two poems on-topic for the evening meeting. Instead of launching into them, I deferred to a familiar “pause button” that registers somewhere below my ribcage. “Nope,” it said. You know when you’re driving in an unfamiliar city, and for whatever reason you’re trusting your instincts rather than your smart phone or GPS? Anybody still brave enough to do that? Perhaps you add basic dead reckoning to past experiences, negotiating toward a performance venue, or the downtown hotel, or the restaurant district. More times than not, such reconnoitering serves me well. Or how about this? You’re entering a building—any public building—and experience a brief catch inside, a caution, not unlike hearing a distant whistle, or catching the scent of a struck match. You might hesitate, look around and choose to stay. If the unspoken wariness persists, you might back out and reassess. The insanity around the mad-dog mongrel in the White House has worn away nearly all all my registers of acceptable, feasible, conscionable standards. And yet we’re subject to the fallout: personally, psychically, internally. Our own integrity as citizens has been shattered. Especially if the state where you live shows up as “red” in political maps. I first placed my hand over my heart and pledged allegiance to the yew-nited states when I was five years of age. The next year, I’d pledge my soul to the Lord My God In Heaven, followed by eight years of parochial school. Eventually I lived in Canada for awhile, returned happily and proudly to America and voted at each national election. Now, when I hear from Canadian friends, I’m so freaking defensive, it’s possible I may actually need to apologize for my furious response to their casual, distant comments around the Clown Chief. Back to the current time: I couldn’t share my clever, double-edged lines of poetry with the gathered roomful of people last month. I’d cobbled tight-fit, astute, laser points of observation—the work was strong enough, for certain. But that check inside my spirit caused me to arch my back, feel vertebrae slip back into position. With intake of breath, I wanted to let go, far from me, that witty, accurate take on the trump. Didn’t want to pick through the detritus in his wake. Don’t want to scoop up his leavings for any purpose whatever, least of all as building material for poetry. Instead, I spoke a bit about harboring ugliness, then releasing it in ways that felt both satisfying and non-violent. And I whipped out a 4’ long paper tie I’d painted red, and cut it into shards, from the podium. I definitely am writing more around these insane American days, but I’ll watchdog where it’s distributed. And not harbor the level of rage that’s totally justifiable. Mid-November 2016. The festive press of promo about the coming holiday season is not helpful. Images of a perfect turkey, puffy dinner rolls and the rest bring zero comfort. I usually can come up with a hundred reasons to be grateful, in nearly all circumstances. Now, I struggle. Thanksgiving’s on the horizon, treasured time with family, yet I catch myself staring into space, unconsciously wiping tears from my cheeks. The psychic eclipse hits so many people just now. Words of comfort during a call with a loved one recently came slowly. Whatever was said needed to be substantial, true and keen enough to penetrate murky realities. That followed “Hold steady,” and other handy phrases around hope. Left unsaid, unrecognized: my own knee-jerk, unconscious response to the two a.m. news broadcast on the ninth. Insomnia, walks in my surrounding woods (defying hunting season), tidying up here and there, revealed that parts of me had shut down. There were heaped cheesy nachos for late meals. A pan of brownies sits on the kitchen counter, complete with thick mocha buttercream frosting. My coffee mug stays full. I re-read Neil Gaiman’s “Ocean at the End of the Lane” quickly, yearning for a practical magick to undo the great American wrong. There’s a monster in a tower, with paperdoll family animated by entitlement and greed. How can that jive with the will of the people? Okay, that’s it. Here’s something so much better, you should try it! Evansville Indiana, Azzip Pizza, several locations. You tell ‘em what you like, they create ‘n bake on the spot. Here’s mine: basil-pesto and marinara sauce base, two cheeses, bacon, mushrooms, sun-dried tomatoes, peppers, onions, shakes of chili pepper. Astonishing. Feed yourself well, spirit and body! A Fresh Slice…but no pie. But do come back, this is the season made of pies: the pumpkin, the pecan, the harvested apple pies. Sweet potato, too. Leaning into commitments from others we trust can be risky. In its highest form, as I see it, belief in a clear vow is, in itself, a gift. “I trust you will do as you say.” Imagine! More commonly, people train us to weigh the potential merit of their promises. That can make for a rugged and steep learning curve. It calls for delicate balance: better to suspend belief, or suspend disbelief? “Trust in God, but row for the shore” makes good sense. And it’s good to know who’s in the boat with us. Anything can happen, and often does. Inside the Sturm und Drang rattling America just now, I’ll resist bitterness and guard my heart. Hope you’ll find a way to do the same. Yes, yes - peach pie! Mmm-mmm! From Reid's Orchard, at the edge of Owensboro, KY, the season's sweet peaches have been thoroughly enjoyed in many ways. Like so much that is perfectly wonderful, the huge, luscious wonders couldn't last long, and weren't designed to do so. Week-long visits from three distant areas were enjoyed this summer. Family from Florida, Missouri and Minnesota arrived, we worked and played, and enjoyed all we could find. Of course, celebratory pie played its part, along with craft beer and wine, swimming, music, porch and bonfire chats—and love a' la mode! SO NOW: time for apples! Pumpkins! Paw-paws for some of us Midwesterners, too. Let them all remind us to get out there, live your sweet life!